Even though Nathaniel Lewis rode his bike to school and played tee-ball just like many other American children of the ’80s, he did so while spending the first fourteen years of his life in a secured Saudi Arabian compound. With his father employed at the time by the government-controlled petroleum and natural gas company Aramco, “I was unaffected by the strangeness of life over there”, recalls Lewis, adding that it “was the only thing I knew, so it was my normal”. As for what this “normal” life entailed, his family “would spend hours going through customs just to get back into the country after traveling”, Saudi Arabian officials having to “go through every book, magazine, and videotape, tearing out pages, blacking out images, or just confiscating things”, remembers Lewis. “As I grew up, after the Gulf War, I learned about more of the challenges that my parents dealt with”, he explains, including government listening devices being placed inside their phones and home. And while Lewis admits that the skills required to make his art came not only from his higher education but also through a series of odd jobs which allowed him to spend “quite a lot of time developing weird ideas and projects while accruing a lot of unusual fabrication skills”, it was the lasting impact of this constant surveillance and paranoia that he was surrounded by growing up that perhaps most influences Lewis’ works, especially his Little Terrors sculptural series. “Back in 2012”, Lewis explains, “I had the initial idea of doing art/toys”, a direction that drew upon the artist’s first “real” postgraduate job as a designer for Maxim Enterprise, “a wooden toy company that works with a lot of toy companies that don’t usually make wooden toys”. With traditional toys for toddlers and even preschoolers made to mimic the “things that seem important to the adults in their lives”, Lewis notes that kids aged between one and six have “no sense of propriety or context, they just see objects”. But “we do a lot of editing”, he adds, as there “are things we’re ashamed of that we don’t want to talk about”, such as “why there are cameras everywhere or why we have to take our shoes off at the airport”. And these aspects of modern life were what he wanted to explore through his Little Terrors series. “In the initial conception of the series”, Lewis says, “I was really into this idea of hyper-articulated child-mannequins interacting with the toys”. With the artist admitting he was “worried that the pieces couldn’t exist outside of a vignette, without an expressive humanoid stand-in”, he realizes now that “the whole mannequin thing exponentially slowed down the development of my ideas”. Ultimately realizing how “making the mannequins into beautiful objects would distract you from the toys”, Lewis concedes, this was resolved when “one day I was in a Macy’s and I saw one of those smooth, egg-head mannequins and it occurred to me that they were a clean slate”. And the result of this revelation was the Playland Security installation at the Phoenix Art Museum‘s Harnett Gallery as part of the 2015 Contemporary Forum Artists Grant Winners exhibition. “Expressionless”, as Lewis describes these mannequins, “they didn’t tell you how to feel about the work”, which was a wood, metal, and fabric construction portraying a twisted airport screening setting in bright colors reminiscent of Playskool or Fisher Price toys. But Lewis’ Little Terrors works are more than an artful evolution of traditional toy forms, with pieces frequently also employing the functionality of playthings, such as how the Pull to Play grenade is built to work like the colorful stacking rings that many children know well. And touches like this, which Lewis admits “take a lot of time and care to design and fabricate”, help immerse the viewer more fully in their own nostalgia and recollections. “Our ability to attribute meaning beyond function is one of the primary things that differentiate us from the animals”, Lewis says, elaborating by explaining “that an object can act as a totem”, a ‘key’ that humans mentally use to unlock memories, stories, and even connections to people. And by putting these pieces under the collective name of Little Terrors, a name that “evoked the feeling of something from the past, something your grandmother would say”, according to Lewis, these works created a juxtaposition between the simpler times of yore and the complex anxieties of modern man. “I’ve tried to be very deliberate in what things I render as toys”, Lewis discloses, “because I think it can quickly devolve into a gimmick or a one-liner if I just started making every little dangerous thing that popped into my head”. As the artist admits, it “takes a lot of work to make something look like it was made in a factory, so the concept has to be just right”. But Lewis’ newest proposed piece in the Little Terrors series is a detour from what has come before, the aptly named Re:VOLVER being a 13-foot aluminum and fiberglass sculpture of a cap gun, which is a massively enlarged rendition of a pre-existing toy rather than an imaginative interpretation of real threats into toy form. Having tackled the subject of childhood indoctrination into gun culture previously with his Automatic Fun design, a wooden assault rifle with a colorful bead-filled stock that can be rattled around, a magazine clip with bullet forms that can be slid up and down, and a spinning smiley face for the bolt catch, this new Re:VOLVER piece seems like a follow-up statement by the artist. And it’s one which will be displayed at the Grand Rapids Art Museum from September 12th through October 14th, 2018, an honor that Lewis was awarded as a winner of this year’s annual ArtPrize competition, allowing his fascinating and frightening message to captivate and illicit consideration from a potentially new audience. As to what that message is, it’s up to the viewer to ultimately decide that for themselves. 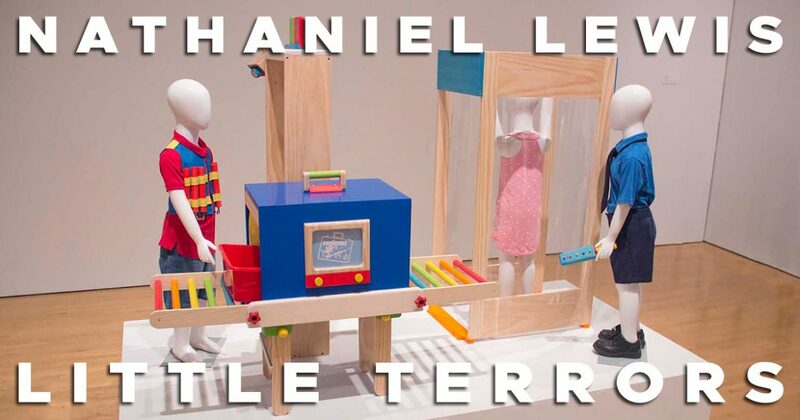 Though if the children are our future, then the future is most certainly frightening; or, at least, it would be if Nathaniel Lewis’ creations were actual toys and not artistic statements. Click Here to Support the Fabrication of Nathaniel Lewis’ Re:VOLVER through his Campaign on Kickstarter.